Pursuant to Republic Act No. 10157, otherwise known as the Kindergarten Education Act, which aims to provide equal opportunities for all children to avail of accessible mandatory and compulsory kindergarten education and skills stimulation and values formation to sufficiently prepare them for formal elementary schooling, the Department of Education (DepEd) implements the Kindergarten Catch-up Education Program (KCEP) to five year-old children and above, who are unable to attend or finish any kindergarten education during the school year (SY). In compliance to the above-cited provision and goal, and to ensure the successful implementation of the Program, the specific Policy Guidelines on the implementation of the Kindergarten Catch-Up Education Program are enclosed. These guidelines shall remain in force and in effect during the succeeding SYs until revised or repealed. The Republic Act No. 10157 mandates all five (5) years old children to avail kindergarten education as the first stage of compulsory and mandatory formal education. Despite the institutionalization of kindergarten education in school year 2012-2013, there are still families who are unable to send their children to school. Section 4.2 of the Implementing Rules and Regulations (IRR), highlights the Catch-Up Program for Children under Especially Difficult Circumstances shall be implemented. This Kindergarten Catch-Up Education Program (KCEP) is an educational intervention for children five-(5) year-old and above who do not have access to schools or daycare centers or those who live under difficult circumstances, such as, but not limited to, chronic illness, displaced due to armed conflict, urban resettlement, disasters, extreme poverty child abuse such as domestic violence, neglect and abandonment, and who are not able to finish the General Kindergarten Education Program. children with opportunities for their holistic development that are created and implemented through partnership among the school, community and other stakeholders of basic education. Specifically, all five-(5) year-old children and above who have not attended or completed kindergarten classes or other community-based early childhood education interventions are eligible to this program. 1.1. Consult with the barangay/municipality/city or the Department of Social Welfare and Development (DWSD) to review their existing database. The Municipal Social Welfare and Development Officer (MSWDO) can provide available household data on children, daycare enrollees, and daycare centers. The Municipal Health Officer (MHO) can also provide maternal and child health program coverage data, which can help establish the population of children, aged five (5) to six (6) years old. 1.2. The DepEd division, district offices and schools can provide information on enrolment in schools with kindergarten classes and other early childhood education programs in the community, including the location of these programs. The school shall also conduct rapid assessment and/or family survey to establish family profiles and status of young children, including information of recipient families under the Pantawid Pamilyang Pilipino Program (4Ps). 2. Prepare individual profile of children following the prescribed format in Enclosure No. 2 and consolidate according to their needs. 3. The generated data can be utilized to determine viable and appropriate educational interventions that are responsive to the needs and diverse type of learners. Identify suitable and available locations for implementation, potential teachers/ facilitators/ volunteers, instructional resources and possible partners to support this program. 4. Ensure strong involvement of, and partnerships with parents, community, LGUs and NGOs on the mapping, planning and implementation of this program. 1. Organize and orient all members on the implementation of the Kindergarten Catch-Up Education Program such as DepEd or school personnel, parents, community, LGUs and NGOs. 2. Provide clear roles and responsibilities of everyone involved in all this program activities. 3. Articulate the re source-sharing arrangements, e.g. DepEd will take charge of the instructional materials thru school MOOE, meanwhile, LGUs/NGOs can tap their own funding sources for expenses such as the honoraria of teachers/facilitators, school feeding program, learning sites and other needs of the children. 4. The schedule of implementation should be clearly discussed. Below is the recommended timetable of activities. 5. The Divisions/Districts/Schools shall start conducting classes after the children have been identified, assessed, and systematically referred to or placed in their appropriate educational interventions. However, it should be open to all identified children at any time depending on their situational needs. Classes shall be held either in schools, daycare centers, and other learning areas in the community or in homes. 6. Those Divisions/Districts/Schools which are ready to conduct KCEP classes after the Early Registration Day may adapt activities in columns five (5)-nine (9) in the above table starting January until May. 7. The Division/District/Schools shall require a copy of the child’s birth certificate or any legitimate document as basis for official listing and assigning learners reference number. 8. The Division office thru districts/schools shall acknowledge and/or issue a certificate for those children who completed this Kindergarten Catch-Up Education Program. Daycare center-based kindergarten classes can be conducted if children have no access to public schools. The day care worker can be tapped, trained and provided with the appropriate curriculum, as long as she or he will conduct separate classes for the kindergarten children. Home-based/community-based playgroups can be organized in areas where children have no access neither to public schools nor daycare centers. Families/mothers may be organized by the DepED so that they can provide the necessary guidance to the children in their community. Playgroups can be facilitated by parent/community volunteers, Barangay Health Workers (BHW) and Barangay Nutrition Scholars (BNS). Itinerant teachers or daycare workers from nearby communities, whose main job is to train the adult community members in teaching children the fundamental learning and school skills, can also facilitate with them. DepEd is responsible for providing the necessary instructional support for the facilitators. 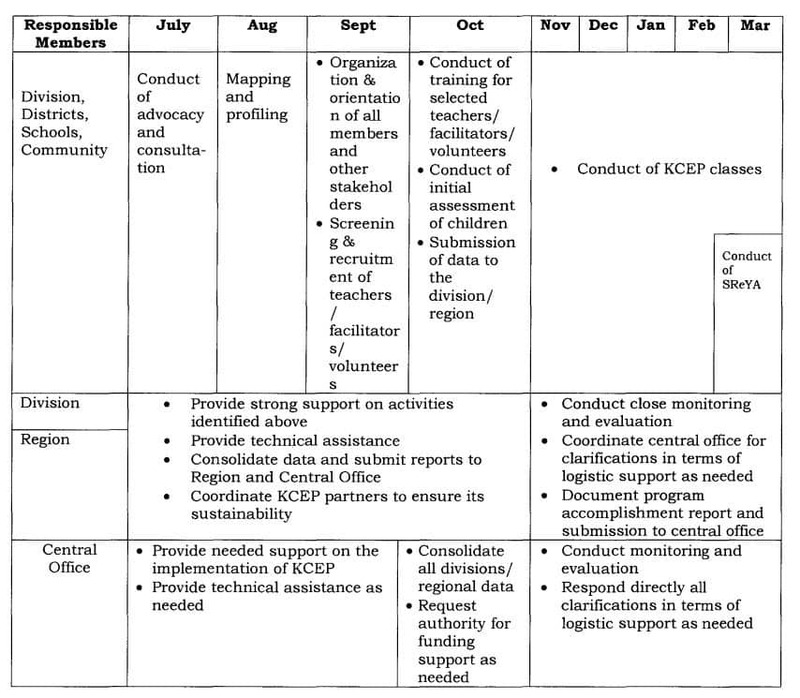 To adapt this kind of delivery mode, it is suggested that DepEd Region and Division offices coordinate with the existing Supervised Neighborhood Playgroups (SNPs) implemented by the DSWD. Some of these SNPs are being supported by NGOs such as Plan International and Save the Children. The content and learning experiences will be consistent with the 40-week curriculum or the National Kindergarten Curriculum Guide (NKCG) for teachers. The modified curriculum is organized according to the same themes although a shorter time will be allotted for exploring these themes, given that the program will run for a shorter period only. Both versions will also be presented in a weekly/daily format. The local language shall be utilized as the medium of instruction. Certain parts of the curriculum will be contextualized/indigenized by DepEd local offices and the community partners, including grassroots people organizations and NGOs, in coordination with the Central Office and the Regional and Division field offices. Teachers/facilitators shall be provided with the above-mentioned curriculum, assessment materials, training and orientation on the utilization of the said instructional materials by the designated trained trainers at the region and the division. For home-based/community-based playgroups, the curriculum modules or session guides will be patterned after the existing SNPs. However, it will be further developed or enhanced depending on the need of the learners, community and the result of the mapping exercises. The Early Childhood Care and Development (ECCD) checklist which has been introduced in previous trainings, shall be administered to children following the specified schedule in the manual. This is intended to determine the child’s developmental skills and performance across the different domains. The teacher/facilitator must also employ various methods to further determine the child’s needed educational intervention. These include observation, direct account of the child’s behavior, and also interview of the parents(s) or caregiver(s). Likewise, the School Readiness Year-End Assessment (SReYA) tool will be administered to the children at the end of the program. The result of assessment will be reported to the school where the child intends to enroll for Grade I, together with the certificate of completion as mentioned in item III.B.7. provide assistance in terms of contingency needs of the teachers/facilitators, e.g. basic supplies and instructional materials, transportation mechanism, among others.